Welcome to the Party! I've been rather busy this month away from my blog, but still thought I could help celebrate the season by joining this giveaway hosted by Michelle at the Quilting Gallery. There's still time to get a little making done this season. 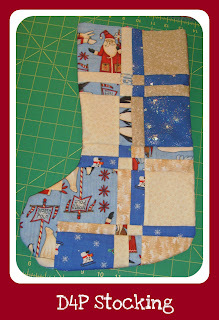 Stocking - simply make and fill or just make! 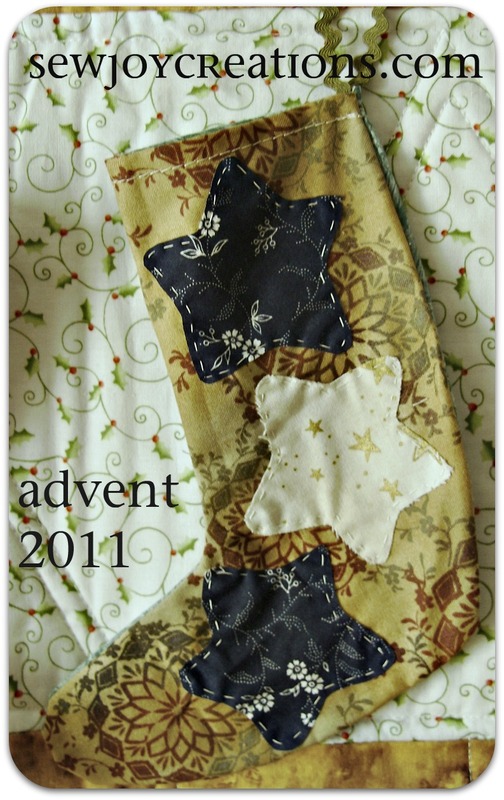 This is a quick, big stocking to make. You can use the template and create any pattern. 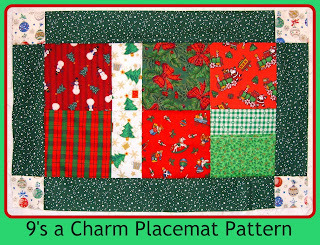 Use up some strips of leftover Christmas prints, solid charm squares, or even one big piece of fabric! You could add seasonal applique - stars, holly, mittens, etc. or maybe the recipients name or the year. Coasters - can you ever have too many?!?! I love placemats. I have more designs in mind, just have to make the time to get to them. 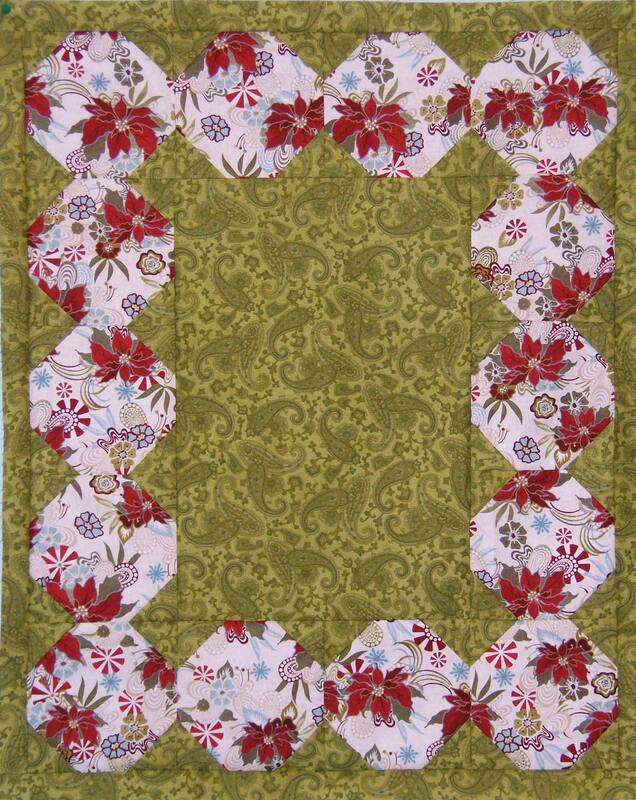 A great, simple project to use up seasonal charm packs. You can purchase this pattern here. 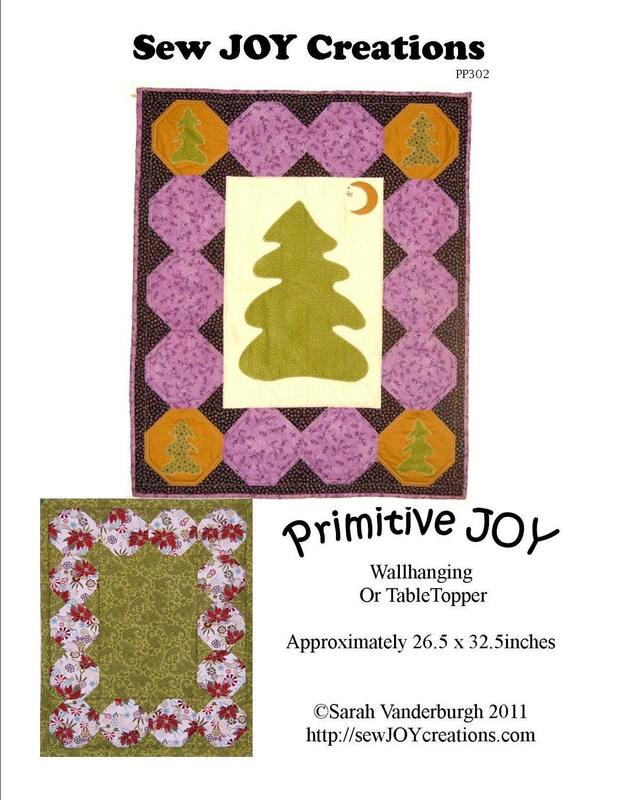 I am giving away a copy of my pattern, Primitive JOY. 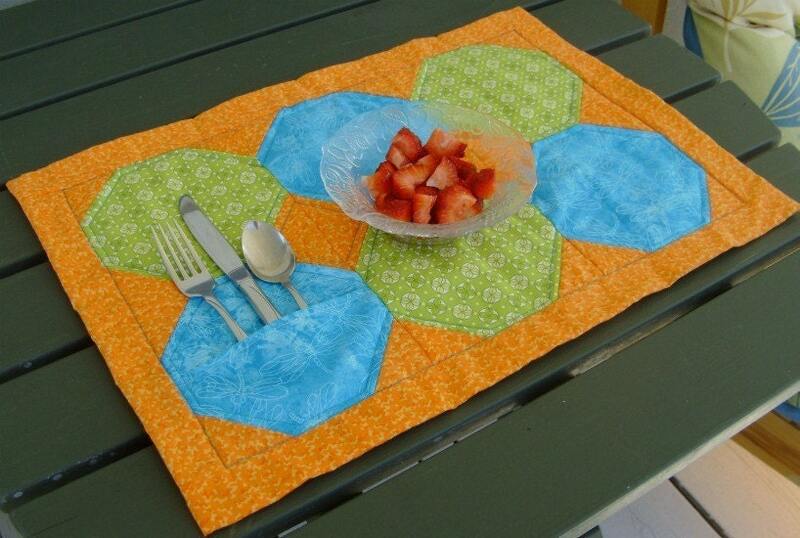 It includes full size templates and a tabletopper version of the wallhanging. and the Fa La La Letter applique. I will be picking 3 winners. My patterns are pdf - download only. You can live anywhere and I can send them to you right away! Leave me a comment to be entered to win. - leave an email address in your comment if you're not sure. 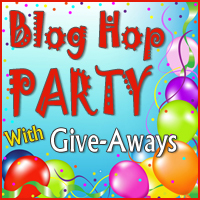 You can always check your blog profile before you start entering all of the giveaways. noon EST Sat., Dec. 17th. Have fun visiting the other party stops! It's not always easy to find something fairly quick to make for Christmas! This year I'm making table runners for my sisters! This year I made mug rugs, very time consuming. So I vote for homemade shortbread! Thanks for the giveaway. I like to sew presents, but they do take time. 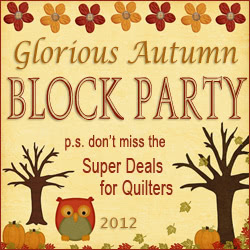 This year I am making a quilt for my grandson and an apron for my son-in-law. That should take me right up to Christmas. Table toppers are my choice for gifts... they can be made quickly enough and I know they are appreciated. I enjoy making pumnpkin loaves of bread, chocolate chip cookies and fudge. I just make up plates and share everything. This way my family has something to look forward to on Christmas Day. What a wonderful giveway on your blog. The pattern is a darn cute one. Thank you so much for a chance to win. I hope you have a wonderful and safe holiday. I usually make many of my gifts, most are sewn. 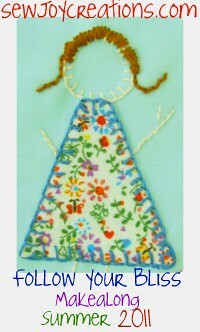 This year time is not permitting so I will only make a few doll clothes for my granddaughters. I am now subscribing to your email newsletter. Thanks for the chance to win. I am making table runners this year!!! I like to make Almond Bread for family and friends, and Christmas cake for my son. I always make my younger 4 grandsons some boxer shorts made from Christmas fabric. thanks for the offer. I am making quilted Christmas ornaments for the tree. I'm making quilted angel ornaments this year. Just yesterday I made fudge to give away. At first I thought that I'd over-bought the ingredients, but when I started making a list of recipients, I reached 24 without pausing for breath. Now there are 26 pans of fudge on my counter waiting to be delivered. 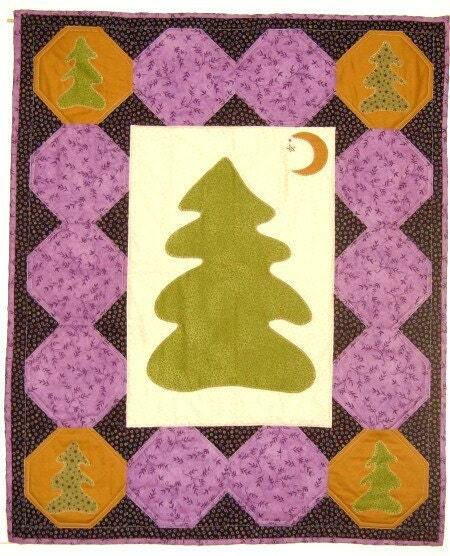 I make a lot of my gifts and this year it includes three cuddle quilts for my grandchildren . Thanks for the chance to win your great giveaway. I like to make stocking stuffers in crochet or knitting. I love making ANYthing from fabric! I love gifting my quilted fabric postcards! Really like to make PJ's for everyone. I just love to create! Thanks for the chance. I love to make pillowcases as my favorite gift. This year we are making Blizzard Bits in seal tight bowls. I am hoping this will become my standard gifts for my families. Thank you for the give away, how exciting. I love to make all kinds of things as gifts. Lately, it's pillows. Before that, lap quilts, and before that homemade cookies and breads. My favorite thing to make for neighbor gifts if my Sour Cream Pound Cake. I make it in loaf pans, so one cake recipe makes two large loafs or three small loafs. I made two today, and the house smells awesome. I enjoy making string pieced hot pads as gifts. Very nice giveaway offer. Thanks for participating! For gifts I like to make runners, mats, little bags, and coin purses. Lot's of fun. those cards look like a great way to use up scraps! I love to make cookies and fudge and other holiday treats. Thanks for the giveaway! Hi, Happy Holiday to you and yours, this year I didn't sew but I did use thread. I made beaded net ornament covers, sew I did sew . Thanks for the giveaway. Pillowcases are so easy and fast. Thanks for the chance to win a great prize. I like to make cookies and candy for our neighbors and friends. I spend a couple of days creating, plating and delivering the homemade gifts. Thanks for the generous giveaway and a chance to win! I've been making chicken pincushions but mugrugs look fun too.